Rickshaws are a kind of three wheelers and are pulled by men. There is another kind of these which we call auto-rickshaw and these run on petrol or diesel. While the earth’s natural energy resources are being consumed very fast and we know that these are non renewable, the demand for Solar Powered Rickshaws is increasing. 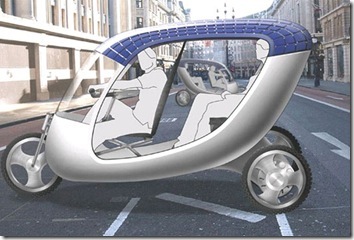 Here is a brief reference from Arun Prabhudesai‘s article, Yes, We desperately need them – The Solar Powered Rickshaws. Rickshaws are powered by men and auto-rickshaws by fuel(specifically diesel or petrol). Solar powered rickshaws are promising because these are gonna prevent environment. The energy source is renewable resource. Commonwealth Business Council(CBS) is helping to implement the necessary technology. Future is bright but it’s really tough job to implement.